Riverwood House and Cottages have cozy and quiet accommodations in a country setting. The owner is very knowledgeable of the south western region and can help you plan many day trips to experience the mountain vistas, wetlands and varied coastlines. Riverwood is a touch stone for your encounter with the culture and history of Southwestern Newfoundland . We have a lovely garden on a wooded lot overlooking Bay St. George and Robinson's River Estuary. It is a place to relax and let the dance of life slow to a country waltz. Perhaps you are an amateur rock hound and would enjoy a day trip to the Ship Cove fossil bed or a walk upstream in Crabbes River where you can observe the wonders of water as it sculpts its way through a deposit of blue banded gypsum. Numerous local pebble beaches will provide hours of activity to the beachcomber and rock hound in search of a special natural souvenir. Whether your passion is salmon fishing or trouting, the host is a licensed guide who can take you to pools and ponds in the local area. We have a canoe that's available for rental to our guests(To ensure availability, please book in advance). At Riverwood you can take a full range of walking /hiking experiences. From the leisurely three kilometer walk to the extreme five-day marine mountain coastal hike, guests at Riverwood can use the host as a guide or resource person to plan their excursions. 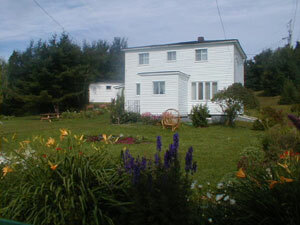 Riverwood house and cottages is five hundred meters from the Newfoundland Trailway. ATV enthusiasts and other users of the T'Railway are welcome. Use the host as a guide or an information source on the T'Rrailway and how to connect to the network of forest access roads. Closer to home, the host pursues his interest in the craft of twig furniture making. If you have a desire to learn how to construct this unique home and garden furniture, spend some time at Riverwood. Twig Furniture projects are found throughout the grounds. Consult the host or take a look at the in house catalogue for items that are available for purchase. © 2017 by Riverwood Cottages.